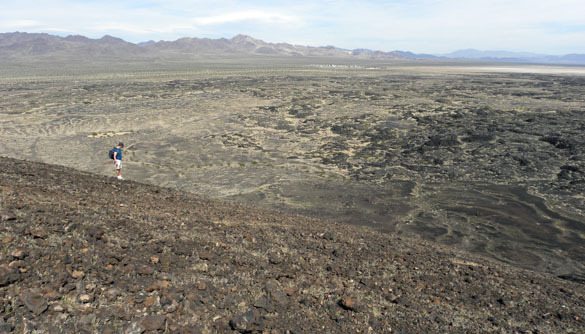 Greg Wiles on the rim of Amboy Crater. ZZYZX, CALIFORNIA–This afternoon the Wooster geologists studied two very different magma products in the southern part of our field area. After lunch we drove to Amboy on historic Route 66 and then hiked up to the rim of Amboy Crater. Here we saw the extrusive, mafic rock basalt at its finest in the cinder cone itself and the lava flows across the valley. Desert iguana on the basalt near Amboy Crater. 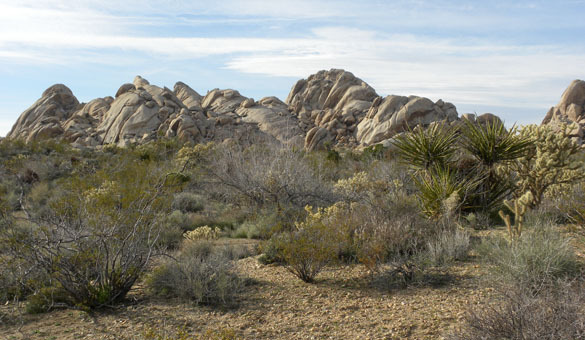 After Amboy, we traveled north to the Granite Mountains and examined wonderful alkali granites weathering into rounded boulders. 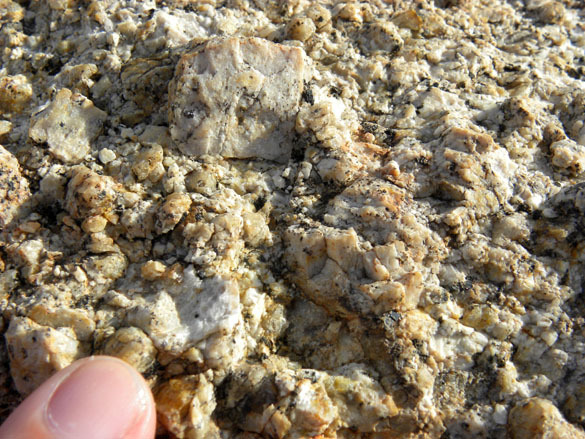 The feldspar crystals in these intrusive felsic rocks were extraordinarily large and numerous, and there were many xenoliths scattered throughout. The countryside here was lush with desert vegetation that made our all-too-brief stop most enjoyable. An exposure in the Granite Mountains, California. The feldspar-rich alkali granite in closer view. ZZYZX, CALIFORNIA–It was surprisingly cool this morning in Zzyzx as we left for our day of fieldwork, but we were not surprised by the wind at our first stop, Calico Ghost Town outside Barstow. Every time we’ve been there it has been blustery. 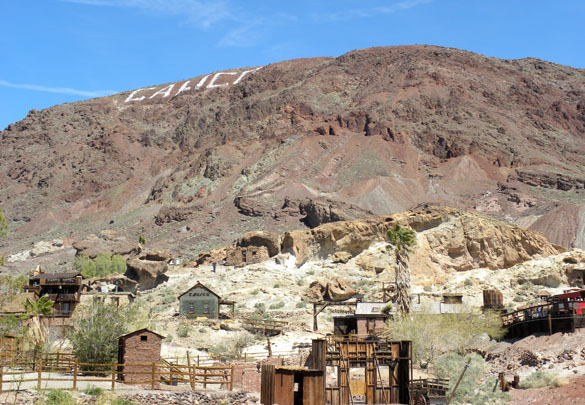 Calico is an old silver mining site with a complex geological structure complimented by hydrothermal mineralization driven by dacite intrusions roughly 17 million years ago. 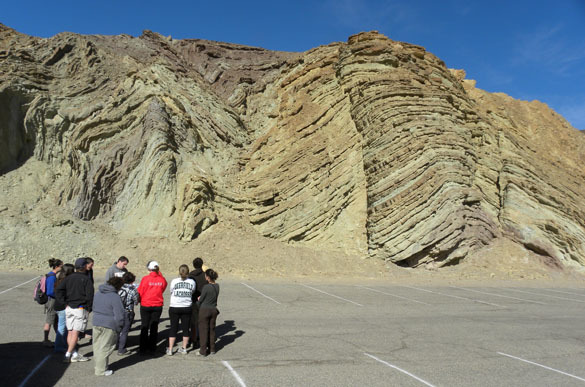 Shelley Judge showed us how strike-slip faulting (ultimately a result of movement on the San Andreas Fault to the west) produced compressional folds in the Barstow Formation. Meagen Pollock talked about how the silver rich veins were formed by thermal alterations of the sedimentary rocks on the flanks of the Calico Mountains. We then spent a little time in the town itself eating our packed lunches and enjoying cold sarsparilla!